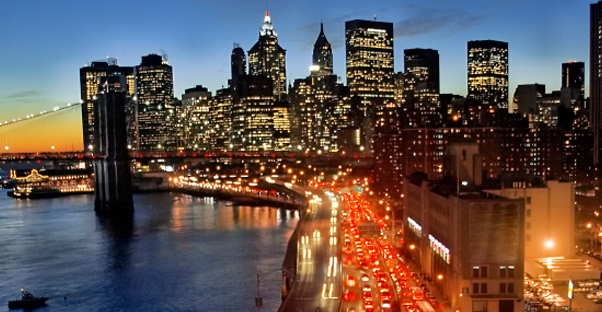 With so much to do and see, you want your NYC trip to be as smooth and efficient as possible. As the quintessential metropolis, NYC offers multiple forms of excellent transportation, both public and private. Its millions of citizens navigate this vast network with total ease, and you can too, with the right background knowledge plus a little research. The subway is far and away the most well-used public transportation in all the five boroughs. Given that it can take you from the far end of the Bronx, through Manhattan, and all the way down to Brooklyn or Queens, it's no wonder why it’s the most popular mode of transportation in the city. Every trip costs exactly $2.50. Before you travel, you must purchase a MetroCard. MetroCard kiosks are available in every station so that you can buy a new card or refill your old one. Visitors who will be in the city for only a short time may want to consider purchasing a 7-Day Unlimited card. This card costs $30, the equivalent of 12 rides. Well worth the cost, even if you ride the subway only once a day. Important Tip: Your MetroCard will work exactly the same on buses as it does on the subway. One ride equals one swipe. If you're traveling in a group, or if you only have a short distance to go, the taxi can be an economical alternative. Taking a cab from midtown to Harlem when you're splitting the bill three or four ways can cost about as much as taking the subway, and will only take about half as much time. If you plan on taking the taxi from one borough to another, be prepared for a heftier sum. Don't forget to tip your taxi driver either - it's only polite! Taxis these days are doing everything they can to make an ever financially-conscious public happier to use this sometimes costly service. Many of the famous yellow cabs are now equipped with credit card readers that allow you to pay the full bill - tip included - electronically. An innovative new app called Hailo allows you to call a cab anywhere in the city. No more competing for attention with the other pedestrians! Just one tap on your smartphone, and the taxi comes to you. Important Tip: Be pleasant with your driver, but act comfortable with your directions as well. You don't want to offend, but you don't want to be taken advantage of either. While Zipcar operates multiple locations in New York, be aware that parking is a real struggle, and may not be worth the effort. Also, many things in New York are located in close proximity to each other. You may find yourself walking from one destination to another without breaking a sweat. Not to mention, it can be a real treat to see New York on the ground level. After all, the city's true character lies in its neighborhoods, not just in its most famous sights.